It all started with a furious comeback in the face of boos from his own fans, but Feleipe Franks's strong finish to the 2018 season has Florida feeling good about a position it rarely feels good about. Plus, the impact of Tate Martell's transfer, beef rib in Jacksonville and the rest of this week's Punt, Pass & Pork. GAINESVILLE, Fla. — Feleipe Franks read that stuff. Maybe not all of it, but if you took to a social media service last season to tell Florida’s quarterback that he sucked, there’s a decent possibility he saw it. Those two were among the few we could show on a family website, but rest assured, Franks saw the nastier ones, too. It got so bad that at one point last season, he deleted the Twitter and Instagram apps from his phone so he could resist the temptation to read the poison. But Franks also heard the in-person assessments of his performance at The Swamp. Those boos wormed their way into his earholes until, finally, he decided to silence them. That moment came on third-and-3 from the South Carolina 10-yard line on Nov. 10. The play was QB Power, and the 6'6", 243-pound Franks barreled his way into the end zone. As he rose from the ground, he ran toward the stands and put his right index finger to his facemask. The message was clear. I heard you. Now shut up. This wasn’t the first time a Florida quarterback had shushed a crowd. In 2007, Tim Tebow briefly quieted the crowd at LSU’s Tiger Stadium by pretending his hand was a phone after a touchdown. That week, LSU pranksters had circulated Tebow’s number, and he’d gotten some calls. But the purple and gold masses didn’t stay quiet long. Ultimately, LSU won that game. Still, that’s an interaction between a player and a hostile road crowd. How often do players shush their own team’s fans? Here’s a better question. How often do they do it twice? Because in that South Carolina game, Franks shushed The Swamp again after scoring the go-ahead touchdown with 4:09 remaining to seal a 35–31 win that required two comebacks from at least 14 down. Franks apologized afterward for the shushing, but he shouldn’t have. He had been savaged by people who claimed to like his team, and he was within his rights to blow off steam. But in a way, those people pushed him to the point where he finally embraced the way he plays best. Franks believes he finally stopped taking the criticism to heart and started using it as fuel. Beginning with the first shushing drive, Franks completed 9 of 13 passes for 126 yards and a touchdown for the remainder of the South Carolina game. He also ran for two touchdowns. And while no one would confuse Franks the runner with Kyler Murray or Cam Newton, his willingness to plow over defenders near the goal line did bear a slight resemblance to Tebow, who excelled in Mullen’s offense when Mullen was Urban Meyer’s offensive coordinator at Florida. What Mullen had been trying to pull out of Franks all season finally clicked when Franks had enough of the boos. If he could run angry, he could make everything else easier for himself. The same Franks showed up in Florida’s two final games against Florida State and Michigan. Including sacks, he carried 26 times for 120 yards and a touchdown. He also had two of his most efficient games as a passer. Against the Seminoles, he completed 16 of 26 passes for 254 yards and three touchdowns. Against the Wolverines, he completed 13 of 23 passes for 173 yards and a touchdown. He didn’t throw an interception in either, and the Gators won those games by a combined score of 82-29. Those aren’t anywhere near Murray or Tua Tagovailoa numbers, but excuse the baby steps for a program that has seemed cursed at QB since Tebow left Gainesville. Before expert quarterback play must come competent quarterback play, and it seemed at the end of last season that Franks had reached that milepost as the Gators crossed the 10-win mark with their Peach Bowl victory against the Wolverines. When Franks flipped from LSU and signed with Florida, he imagined double-digit win seasons and playing for SEC titles. You’d expect that from someone whose first vivid memories of football are of the team from two and a half hours away winning national titles. He didn’t expect that in the first year he touched the field, the Gators would go 4–7 and the coach would get fired. Plenty of quarterbacks who played too early never recover from the kind of psychological damage that gets inflicted on them when they struggle. They go into a shell or they develop the yips or they just stop developing at all. Franks could have been one of those cautionary tales, and following Florida’s 38–17 loss to Missouri on Nov. 3, it seemed like he might be. The Gators had gotten shelled by Georgia the previous week, and Mullen had yanked Franks for fellow redshirt sophomore Kyle Trask as the Tigers ran away with a win at The Swamp. The following week, Mullen announced an open competition for the starting job ahead of the South Carolina game. Mullen says now that a change was not nearly as imminent as everyone thought, but the competition ended when Trask broke his foot during the Gators’ Wednesday practice. Franks was Florida’s starter, for better or worse. And when Florida was down two touchdowns early against the Gamecocks, the crowd assumed the worst and let Franks know it. People who aren’t me tend to come up with the best topics for this section. This week, O-Zone writer Tony Gerdeman (check him out for all things Buckeyes) bails me out. First, the ground rules. We’ll limit this to live action shows. Otherwise, we’d just have vehicles from G.I. Joe and M.A.S.K. 1. Quarterback Tate Martell got his waiver to play immediately at Miami, and that news last week had coaches and athletic directors fretting that the transfer floodgates will open because the NCAA isn’t interested in enforcing the rule that requires undergraduate transfers to sit out a year. Coaches, who hop jobs constantly with little regard for what happens to the players they leave behind, will not get much public sympathy on this issue. But Florida Atlantic coach Lane Kiffin, who just landed offensive line transfer Calvin Ashley from Auburn, did make an interesting point in an interview with the Palm Beach Post. With so many players transferring, Kiffin would like to see an accommodation for the programs that lose players that would allow them to get back to 85 players on scholarship even if that means exceeding the NCAA’s limit of 25 new players a year. Kiffin’s reasoning? Player safety. A team playing short of the scholarship limit could be forced into some serious depth issues if one position group has bad injury luck. “You’re going to see rosters around the country that are not at 85 and they won’t be able to get to 85,” Kiffin told the Post’s Jake Elman. “So what do you do if you have 25 seniors and 10 guys transferring. That’s 35 off your roster, but you’re capped at 25. 2. USC’s athletic department has produced a ton of negative news, but it also provided last week’s most inspiring story. We met Jake Olson shortly before he lost his sight, but blindness didn’t stop him from joining the Trojans as a long snapper. Olson has wrapped his career, but he hasn’t stopped amazing us. Prior to last week’s pro day, Olson asked for donations based on the number of reps he did with 225 pounds on the bench press. The proceeds would go toward research for a cure to retinoblastoma, the cancer that robbed Olson of his sight. Olson threw up 17 reps and so far has raised more than $55,000. If you’d still like to donate, you can do it here. 3. The football officiating situation in the Pac-12 is even worse than last year’s scandal revealed, according to a letter three former Pac-12 officials sent to commissioner Larry Scott that was obtained and published last week by Jon Wilner of the Bay Area News Group. In the letter, retired Pac-12 officials Mack Gilchrist, Charles Czubin and Fred Gallagher claim that Pac-12 general counsel Woodie Dixon’s overruling of a targeting call during the Washington State-USC game was not the first time Dixon has meddled with in-game officiating. The officials also blamed Dixon for the resignation of respected former supervisor of officials Tony Corrente during the 2014 season. The letter from the officials is just one more leak in the dam for Scott, who has been roundly criticized for his leadership the past few years. On Saturday, Oregon State announced that president Ed Ray will step down in 2020. Ray has been one of Scott’s staunchest supporters, and his departure likely will hasten the erosion of the support Scott has enjoyed from the Pac-12’s presidents and chancellors. After spending a weekend in NCAA tournament-land, there is one phrase that continues to drive me crazy: Score the basketball. The ball is literally the only thing with which one is allowed to score. You can’t score your shoe. You can’t score your shorts. Just say “score.” Please. I’m begging. The cut where barbecue meets fine dining is the beef rib. The white tablecloth places will braise beef ribs, strip them off the bone and serve them on a bed of polenta or some other starch. 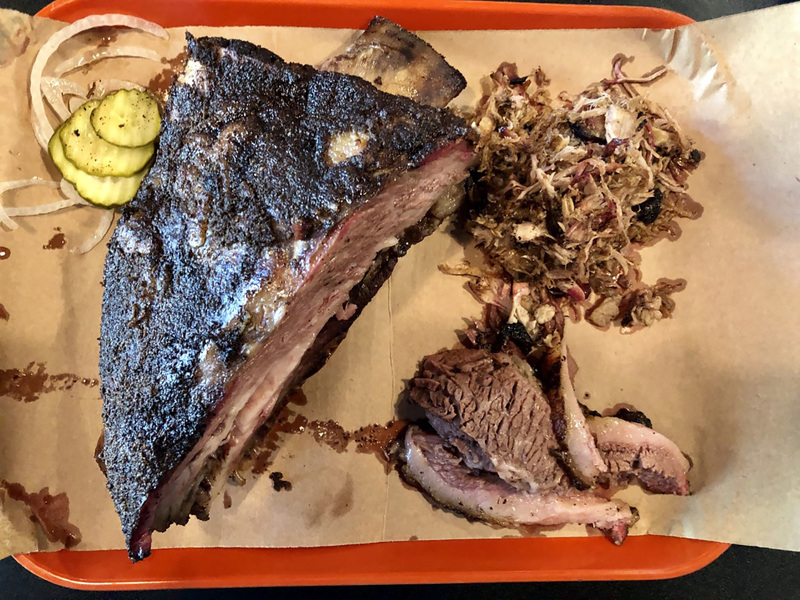 A butcher paper-and-tray place will rub that sucker down, chuck it in the smoker and then watch as everyone who ordered something else oohs and aahs at the modern equivalent of the bronto ribs Fred Flintstone ordered at the drive-in. But here’s the thing: The place that charges you more for less of the same thing doesn’t usually cook it as well as a great barbecue joint. Good braised ribs plated beautifully can be delicious, but they can’t match the visceral delight of a giant, meaty smoked beef rib dripping grease all over a piece of butcher paper. So when you find a place that smokes a good beef rib—the “good” part is important, because a bad one can be a tough, stringy mess—you order that beef rib and watch as your fellow diners stare with envy. If you find yourself at The Bearded Pig in Jacksonville, Fla., order that beef rib. The place has a patio that takes full advantage of the weather that for nine months makes us Floridians forget how the place feels in July, August and September. Music blasts. Craft beer flows. They brag about their brisket, but you don’t want it. It’s just O.K., and you have a much better beef option. Order that rib. This probably means you’ll need to go for lunch. I arrived for an early dinner last week because I’m an old person, and they only had two left. I was grateful to the lunch diners who ordered incorrectly, because the rib was fantastic. A huge pad of tender, salty, slightly spicy meat sat on a massive bone. It didn’t fall off the bone, but it came off with just a little pull. The rib is enough for two if you’re ordering sides—and you absolutely should order the spicy, tangy collard greens—or you can eat it by yourself if you can handle the curious stares of your fellow diners. The other item you need to order is the poutine. If you’ve been reading this space regularly, you know how much I appreciate Quebec’s mightiest contribution to the unhealthy appetizer canon. I also love that so many places have added their own regional spin as the dish has taken hold in America. I’ve had milk gravy poutine in Louisville and tikka masala poutine in Palo Alto. At The Bearded Pig, cheese curds get replaced by pimento cheese. 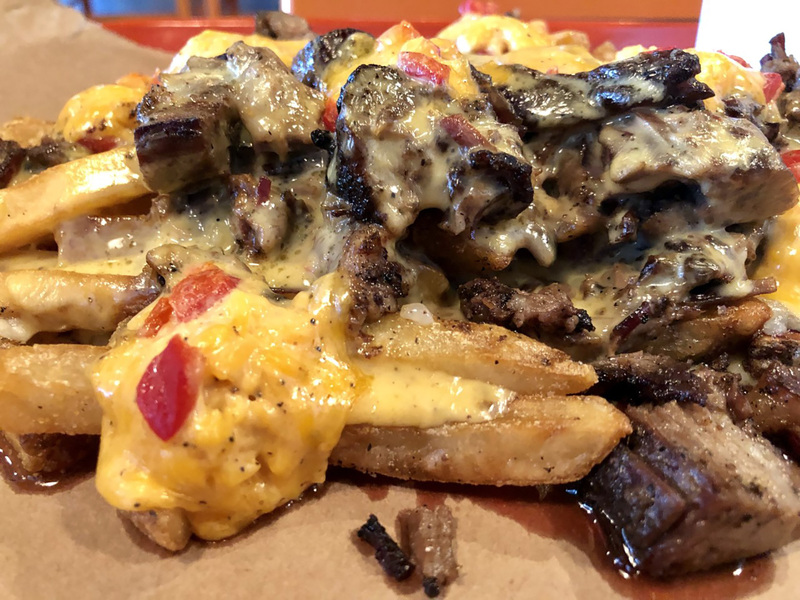 The “gravy” is the grease from the generous chunks of brisket and burnt ends. Take a fresh-cut fry covered in this mélange of saturated fat, and you’ll never want to eat anything else. Unless it’s that beef rib.